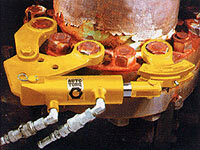 The Auto-Spreader provides up to 10,000 pounds of force to separate flange faces up to 3 inches. 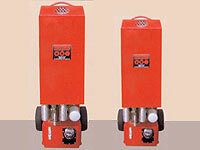 Available in hydraulic (HS-10K) or manual (MS-10K) models. A standard hand pump powers one hydraulic Auto-Spreader, or a pair, with ease. The manual Auto-Spreader uses a ratchet handle to transform 100 ft-lbs of input to 10,000 lbs. of spreading force to create the gap between flange faces. 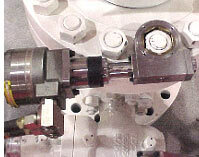 A load lowering valve is available for hydraulic pumps to control the closing rate of the HS-10K. Auto-Splitter - The Clean Cut Solution to Removing Frozen Nuts. 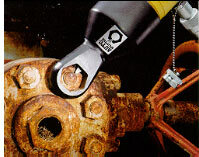 With Auto-Splitter you can easily remove heavily corroded, seized nuts quickly, quietly and safely! One Auto-Splitter does the work of several competitive models because each housing can be used with a wide range of nut sizes. With most other nut-splitters, one housing will only fit two nut sizes, forcing you to purchase a larger number of housings. But each Auto-Splitter housing fits 6-9 different sizes. 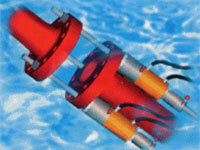 With Auto-Splitter, you can also use the hydraulic cylinders with more than one housing. The special housing design of the Auto-Splitter fits into tight spaces, so that you can work from more angles and in more applications than with competitor's models. It fits all API and ANSI flanges and virtually all valve bonnets. Auto-Splitter cuts from 5/8" to 6-1/2" (16 - 165 mm) across the flats hexagonal nuts. It can be used for both inch and metric sizes, and with any shape nut. Round, square, 12-point and other special nuts will require the use of an adapter. Also available, are adapters for splitting hulk bolts. Fast - 36 times faster than ratcheting tools, turns at 6 revolutions per minute. Convenient - “Fully Reversible” without removing from the nut, power can be applied in clockwise or counterclockwise rotation, low profile design - works in tight quarters. Safe - Prevents accidents by eliminating hammers, dangerous slugging wrenches and cheater pipes. Durable - Rugged stainless steel body, only two moving parts in wrench head.  Various models, range of torque from 100 to 40,500 ft. lbs.  Light weight, "best power to weight ratio in the industry"
 Interchangeable wrench heads and reaction units available for any nut size. Includes 25 ft hydraulic hose with fittings, 25 ft. remote control assembly. filter/regulator/lubricator and liquid filled hydraulic pressure gage. For Leak Free Bolted Joints! A bolted joint obtains its superior characteristics through proper clamping force on the gasket contact surfaces. 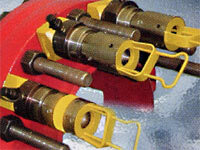 The clamping force, or bolt load, is caused by correctly tensioned bolts. If the bolts have not reached required tension, there is insufficient clamping force and the joint is not up to specification. If excessive clamping force is used, the bolt, gasket, and/or the flange may be damaged. In either case, a leak is the probable result. Therefore, it is imperative that the proper clamping force is achieved. 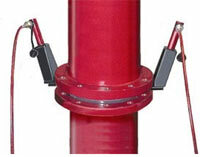 Direct Tension Indicators provide the means to measure bolt tension (bolt load).  Design allows for 100% stud coverage from one side of any ANSI or API flange.  Models available with lifting capacities ranging from 35,000 to 422,000 lbs. 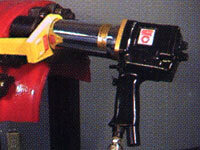 Air-Torq™ air-powered pneumatic torque wrenches offer a smooth, quiet & accurate gear reduction drive.